Burj Al-Luqluq Social Center Society in cooperation with Terre des Hommes presented Quds moral and Terre des Hommes Garden at Al-Hasan Al-Thani school within Live the Burj project, supervised by the Welfare Association and funded by the Arab fund through the Islamic Development Bank. 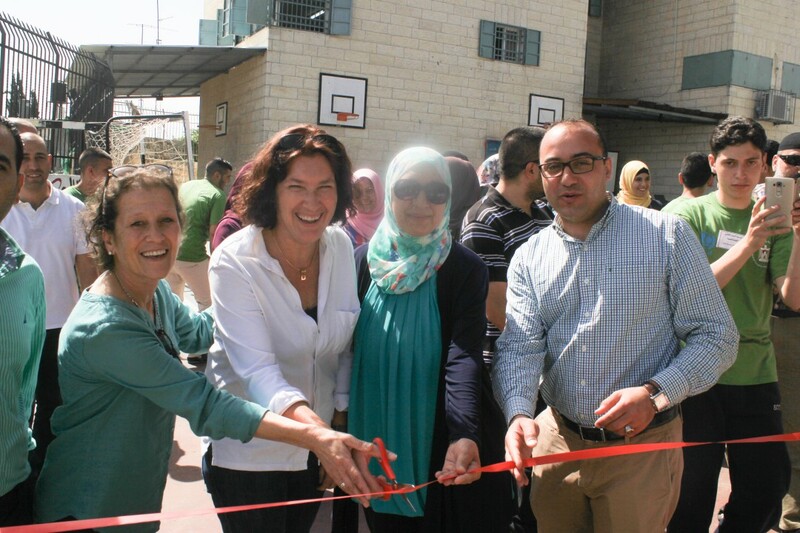 The Public Relations Head of the Ministry of Education, Sawsan Al-Safadi, Burj Al-Luqluq Executive Manager, Muntaser Edkaidek, the representative of Terre des Hommes, Salma Al-Khalidi, in addition to the Head Master of Al-Hasan Al-Thani school, Alaa Abu Shkheidem, the art trainer, Sundos Al-Rajabi and the project coordinator, Ahmad Jaber attended the opening ceremony with the participation of a number of parents, teachers and students who achieved this initiative. The art trainer who executed and supervised working on the mural gave an introductive speech about the mural and how she executed it with the students. Moreover, the project coordinator, Ahmad Jaber gave a review of the rehabilitation of the garden, how it used to be a landfill and how it was turned into a garden full of flowers and plants.